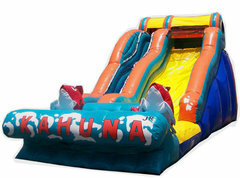 This 22' slide is the best of both the slide world and the inflatable world. 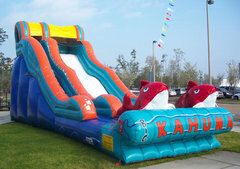 The kids will slide down with ease and speed, but dont worry, there's an inflated bumper pad at the bottom to slow them down. 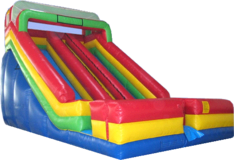 We can bring this inflatable fun to the Atlanta area as well as Alpharetta, Auburn, Buford, Conyers, Covington, Decatur, Duluth, Gainsville, Huchton, Lawrenceville, Lilburn, Lithonia, Marrietta, Monroe, Norcross, Roswell, Snelleville, Stone Mountain, Stockbridge, Suwanee, Tucker, Winder, and many more! 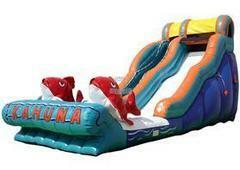 Make it a race to the bottom with our 26' Double Slide! 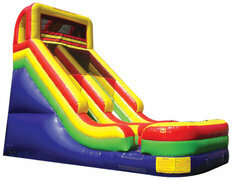 Featuring a central ladder wall to get up and two slides, this is our most asked for inflatable. We can bring this inflatable fun to the Atlanta area as well as Alpharetta, Auburn, Buford, Conyers, Covington, Decatur, Duluth, Gainsville, Huchton, Lawrenceville, Lilburn, Lithonia, Marrietta, Monroe, Norcross, Roswell, Snelleville, Stone Mountain, Stockbridge, Suwanee, Tucker, Winder, and many more! A little smaller than our other slides but just as much fun! Perfect for the smaller kids or the cul-de-sac. 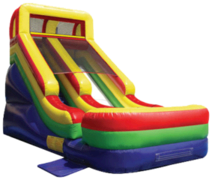 We can bring this inflatable fun to the Atlanta area as well as Alpharetta, Auburn, Buford, Conyers, Covington, Decatur, Duluth, Gainsville, Huchton, Lawrenceville, Lilburn, Lithonia, Marrietta, Monroe, Norcross, Roswell, Snelleville, Stone Mountain, Stockbridge, Suwanee, Tucker, Winder, and many more!